Oatmeal crust studded with candy-coated chocolate and filled with cream cheese and cranberry layers. Crumbly topping adds crunch. 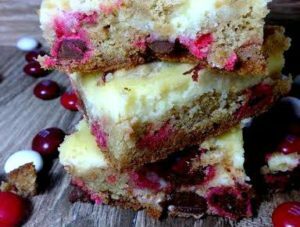 Here is an easy dessert recipe for Chocolate Cranberry Cheese Bars. Preheat oven to 350°F (175°C). Lightly grease a 13x9x2-inch baking pan; set aside. In a large bowl, combine together flour, oats, butter and 3/4 cup sugar in a large bowl. Mix with a pastry blender mixture resembles coarse crumbs. Remove and reserve 1 1/2 cups of mixture from bowl and combine with 1 1/4 cups candy-coated chocolate pieces; set aside. Add remaining 1/2 cup chocolate pieces to mixture in bowl and stir until evenly distributed. Press into prepared pan and bake for 15 minutes. Cool completely. Beat cream cheese until light and fluffy. Gradually mix in condensed milk, lemon juice and vanilla until smooth. Spread evenly over cooled crust. Combine cranberry sauce, cornstarch and remaining 1 tablespoon sugar in a small bowl. Spoon evenly over cream cheese. Sprinkle reserved oat mixture over cranberry mixture and bake for 40 minutes, or until top is golden brown. Cool at room temperature. Refrigerate before cutting into bars. Store in refrigerator tightly covered. Makes 24 bars.